Some of you have expressed interest in giving Danneel and I baby gifts for our little girl. We would ask instead that you donate to this wonderful charity. We are truly grateful for your support and generosity. The couple married in Dallas, TX back in May of 2010. Jensen, 35, and Danneel, 34, met on the set of short film The Plight Of Clownana, and started dating around the time of filmingTen Inch Hero. Best friend and co-star Jared Padalecki and his wife Genevieve had their first baby, Thomas Colton, last March. They were both groomsmen in each other’s weddings in 2010 and no doubt their children will become fast friends on the Supernaturalset. They are expecting their baby girl to arrive in June. With Thomas Colton only a year ahead of baby Ackles, who knows what the future could hold. Fans would love nothing more than to see a new Texas Padalecki/Ackles couple. Supernatural star Jensen Ackles, who is expecting his first child with his wife, Danneel Harris, wants his fans to help him out with a good cause. Talk about a great cause from a very great actor, right? Plus, there’s only so many baby wipe warmers you can get! To donate to the cause, check out the link here! More than 100 new hats were recently donated to the Valerie Fund Children’s Center at the Children’s Hospital at Monmouth Medical Center, 300 Second Ave., Long Branch, to benefit children who have lost their hair as a result of cancer treatment. The hats were dropped off by three students representing the SkillsUSA club from the Monmouth County Vocational School District: Ebed Rincon of Ocean Township, Hector Pint, of Eatontown, and Marquis Johnson, of Neptune. Active members of SkillsUSA from the auto mechanics, nursing and electrical programs participated in the hat collection, which was spearheaded by the district’s Middletown campus club advisor, Dan Marra. Students approached Marra about the possibility of raising awareness for the Mad Hatter Hats Off for Cancer drive benefiting children and teens stricken with cancer. Since its inception in 1996, Hats Off for Cancer has worked with hospitals, camps and individuals to distribute more than 1.5 million hats to cancer patients. Friday’s were extra special at Canton Charter Academy in the month of January as students wore hats to raise money for children with cancer. 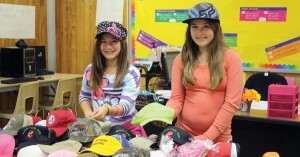 The school’s National Junior Honor Society sponsored a fundraiser for the nonprofit organization Hats Off For Cancer. Students donated a dollar for the chance to wear a hat on Friday. 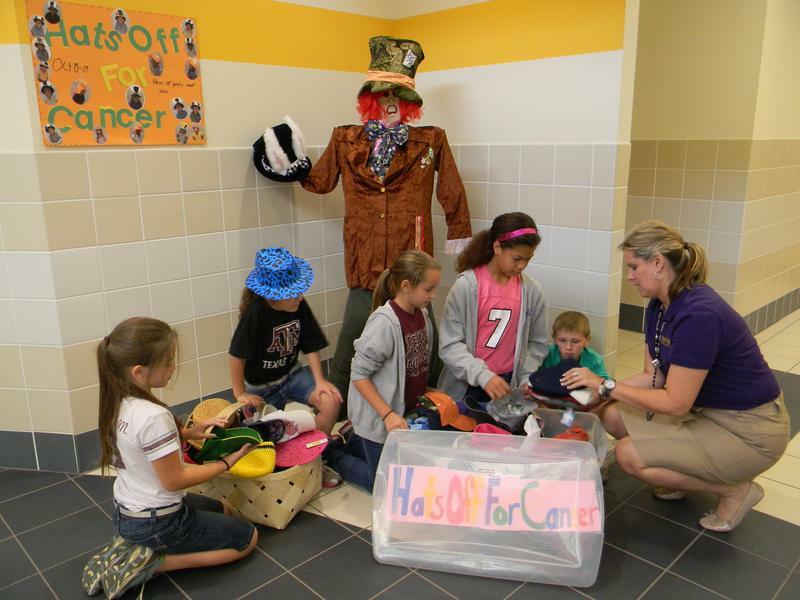 Hats Off for Cancer uses donations to provide hats to children who have lost their hair due to cancer treatments. MacKinnon said he hopes the fundraiser shows students that even the smallest donation can have a huge impact for a child battling cancer. All of those dollar hat days added up fast and the school donated $1,040 to Hats Off For Cancer. 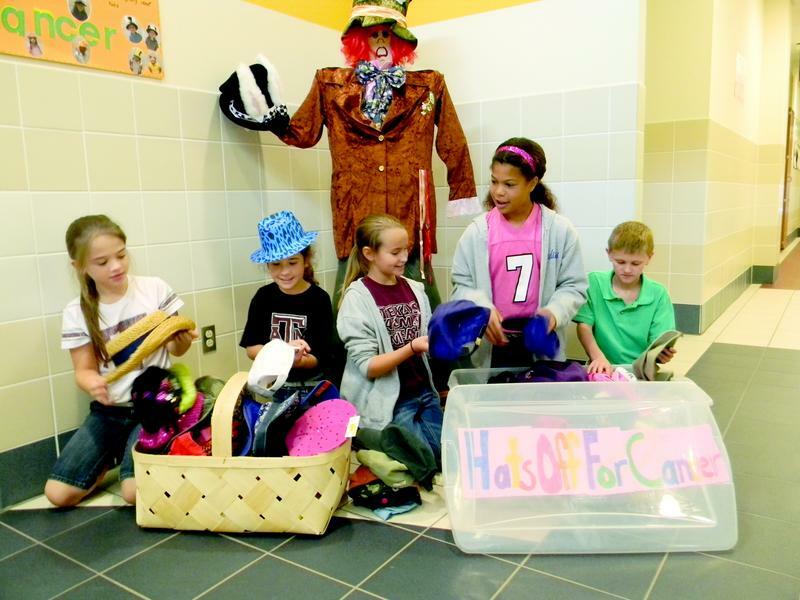 East Side teachers Emily McKnight and Mandy Johnston spearheaded the Mad Hatter Drive as part of a Hats Off for Cancer project at the PK-4 program. Students from their 3rd and 4th grade Applied Learning Community classes collected 133 ball caps, berets and various other kinds of hats to donate to anational organization benefitting children with cancer. The ACL students wrote PSAs about childhood cancers that also dispelled myths about the disease, they said. Searcy said they researched the project and coordinated it from start to finish, along with taking charge of a Pink Out T-shirt sale held earlier in the month at the school to raise breast cancer awareness. “They took it and just ran with it,” Searcy said.